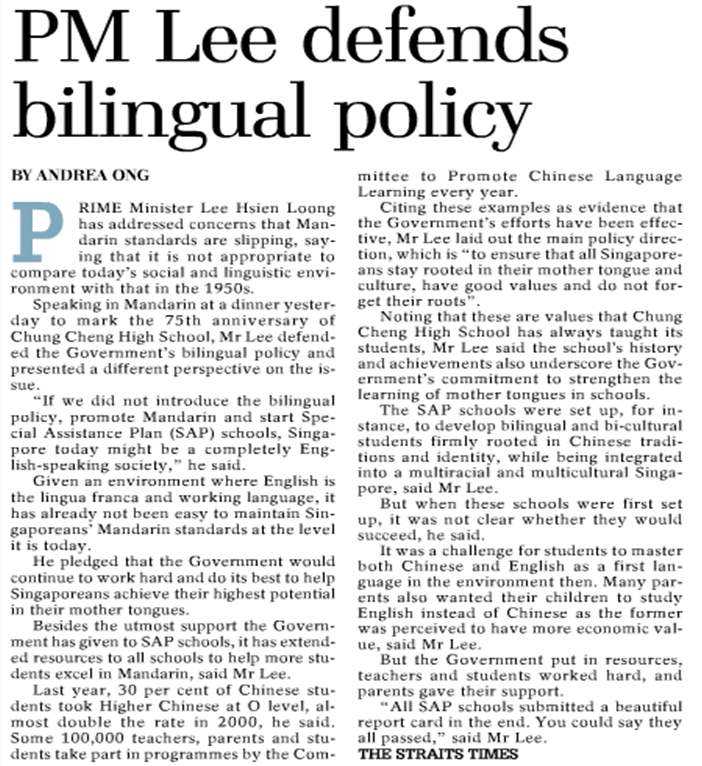 “Given an environment where English is the lingua franca and working language, it has already not been easy to maintain Singaporean’s Mandarin standards at the level it is today” (PM Lee Defends Bilingual Policy, Miss Andrea Ong). At the 75th anniversary of Chung Cheng High School Prime Minister Lee Hsien Loong spoke of the importance of bilingualism, and how Singaporeans should “stay rooted in their mother tongue and culture, have good values and do not forget their roots”. This notion – of staying connected to a culture which is ostensibly tied to one’s ethnicity – has been used consistently to justify the learning of our “mother tongues”. As a student in a Special Assistance Plan school we were warned not to become 香蕉人(“banana person”): to be a yellow-skinned Chinese who can only converse in English, the language of the white Caucasians. Yet, what are these “roots” we speak of? Am I not rooted in … Singapore? And surely we have to concede that general fluency in the Chinese language has declined over the years. PM Lee, nevertheless, is insistent that “it is not appropriate to compare today’s social and linguistic environment with that in the 1950s”. Already I hear frustrated groans from the Han Chinese community, that this young bloke is an ignoramus. They might be right about my detachment. I have never set foot on China (besides a school trip to Hainan). I do not know which village or province my ancestors were from (my grandparents first lived on Pulau Ubin before moving to mainland Singapore), and have no interest in finding out. My understanding of the “Chinese traditions” PM Lee alludes to stretches no further than the rites and rituals my family observes, and I am not sure if I will pass these practices on. I am also clueless as to what the collective “Chinese identity” entails. The Chinese language? Confucianism? Chinese pop culture? What does it mean to be a 炎黄子孙 (descendants of legendary ancestors), to be part of the 中华民族 (the Chinese race)? And surely we have to concede that general fluency in the Chinese language has declined over the years. PM Lee, nevertheless, is insistent that “it is not appropriate to compare today’s social and linguistic environment with that in the 1950s”. More students are taking the Higher Chinese subject, and Singaporeans have taken part in programmes by the Committee to Promote Chinese Language Learning every year, he was keen to add. Quantitatively he may be right. According to the census the proportion of persons who spoke Mandarin most frequently at home inched up from 35 per cent in 2000 to 35.6 per cent in 2010, while the statistic for Chinese dialects decreased from 23.8 to 14.3 per cent over the same period. Yet such information reveals little about the quality of Chinese language education in schools, or more importantly the student’s mastery of a difficult language. It says nothing about the level of interest too. When I took my Higher Chinese examination it was a purely written assessment, with no way of gauging listening or oral skills. I scored an A1 for the examinations, but with little preparation I will barely make it through a dialogue session or business presentation organised in Mandarin today. Call me pragmatic, but should we not view our present “mother tongues” through economic lenses, especially in the schools? In other words commercial reasons made English our lingua franca, so why should we not impress upon students that mastering one more language – perhaps one which is also conveniently spoken at home – is practical and beneficial? That China, India, and the South East Asian nations are emerging economies Singaporeans should be looking hungrily to? In fact in this vein we might view dialects less derisorily too. Just ask a Singaporean business person who has used Cantonese to do trade in booming Hong Kong. It would be presumptuous of me to claim that such pragmatism should be the only reason to be bilingual. And reductive too. The government and the Ministry of Education should be cognisant of different motivations of students, to diversify its justifications for the “mother tongues”, and therefore tailor parts of the school curriculum. To focus more on oral conversations, to go through technical business or scientific terms for instance. Merely saying that the purpose of the “mother tongue” is to stay rooted per se is counterproductive, because some of us do not identify with this narrative. Blind insistence on this association would only drive students further away from the learning of the language. A very interesting point of view. Interesting and agree on the most part that emphasising on the business benefits will appeal and motivate young Singaporeans more in mastering the Chinese language. Though my experience doing business in China would resonate with PM’s insistence and emphasis on “connecting” with our roots as the Chinese are far less impressed by a foreign-born Chinese who can speak the language fluently for business (as many Caucasians can too) than one who can fully embrace the language as a native tongue almost and its culture, history, etc, and at the same time also embracing the “western” culture we live in – that is what that gives “bilingual” Singaporeans a business advantage over other foreigners and to be seen as an “own person” and be “included” as Chinese are big on that ‘guan xi’ feeling in business relationships especially. Even Chinese borned in America and UK to Chinese parents are deemed as “outsiders” to the Chinese in China and almost with dissent because of how obviously “disconnected” they are as their grasp of the language is poorer than a primary school kid in Singapore even if they can engage in business that a kid can’t. Though my personal interest in Chinese/China was not cultivated in Singapore but during my college years in Australia and UK, what Singapore bilingual education did was to offer me a good foundation but perhaps what it needs is to also trigger and cultivate real interest in “roots” beyond just forcefeeding the language painfully so albeit good intentions! That’s my observation from my experience from working in China! While language is tied to culture I think they’re not necessarily one and the same. Like for instance I have friends who are not bilingual, but are bicultural. Former Foreign Minister George Yeo wasn’t extremely conversant in Mandarin, but few would doubt his familiarity with Chinese history and culture. Of course I can only speak of my own experience, as you did too. I think my Chinese / Mandarin is pretty okay, largely because of the schools I went to. But I rarely felt the connection to the “roots”, and only went about with learning because I kinda knew it would be important in the future. This is in no way a critique of bilingualism, which I think is important. But it’s the way we impress upon students, on why they should learn another language – “mother tongue” or not. Not everyone will buy the “roots” justification, and it’ll only get harder in years to come methinks. I think the issue is being able to further unpack roots for students than throwing it out there simply as a necessity just because of our racial or ethnic heritage. It’s quintessentially a question of identity and belonging – embracing racial or ethnic identity that answers why you are different and it’s okay, be secure in one’s own yellow skin literally, especially in a world where “white superiority” is still very much prevalent. Singaporean-Chinese kids are fortunate to not have to be raised wrestling with their racial identity as much Chinese kids born and raise elsewhere in the the western world. Most Chinese-Americans in my circles feel displaced neither here nor there largely because they have been so disconnected from their racial identity, that is when I realise how my bilingualism actually empowered to me being comfortable in my own “colour” than Chinese born elsewhere could be so. A language is the definition of a specific culture, at a specific place, at a specific time. Change the culture, the place, or the time, and the language necessarily changes; if the language has changed, then that is authoritative proof that at least one of the other three things has as well. (Emphasis his, consistently). One thing that’s likely unique to Singapore has been how the (faux) “mother tongue” program (a real one would teach Hokkien, Cantonese, Teochew, or a dozen others; Mandarin is simply an imperial nod to practicality). This has been an essential tool in preventing Singaporeans from aggregating one shared language in which we communicate competently, effectively and universally and, by so doing, preventing Singapore from developing a unified culture that might (oh, the horror!) not be under the complete control of the Party. Without a single culture, communicated by universal competence in a single common language, we literally can never be “one united people, regardless of race, language or religion” and thus the Party may rest assured that we never can “build a democratic society based on justice and equality”. Yes, respecting traditions and keeping cultural history alive is important. “A generation which ignores history has no past – and no future”, as the saying goes. But using the past as a wedge to divide people in the present isn’t a sign of a good leader, or even a cynical one. It’s a sign of a lazy leeader, who holds his subjects in contempt. Let’s return the favour — and share our traditions without beating each other (or our children) about the head with them. You can use pragmatism to justify learning Mandarin, but what about Bahasa Melayu ? Of course comparatively, quantitatively, the usage of 普通话 is more ubiquitous, but Tamil and Malay (notwithstanding different variations) are not uncommon. The same argument of pragmatism will still stand. Considering that we have limited time and ability in learning languages, ideally, you would want to learn languages which are able to give you the most ‘returns’ right? The 2 most widely spoken languages are Mandarin and English, so pragmatically speaking, everyone should learn English and Mandarin regardless of their mother tongue right? Pragmatism isn’t tied to outcomes per se. If an individual grows up speaking a certain language, that mastering that would be more practical. Isnt pragmatism defined by its emphasis on practical outcomes? Anyway, if you live in an environment where you are a minority in terms of your language group, how will it be practical to master it instead of the majority language? You’ll encounter discrimination (i.e. jobs, education opportunities) and difficulties in accessing some commercial/public services. Not necessarily. There is pragmatism in: i) the actual mastery of the language (which I referred to); and ii) the application of that language (which you referred to). Do you have a specific context in mind, for your second point? In Singapore, with English as the lingua franca, the said discrimination is not as pronounced. you mean the mastery of a language as an outcome itself? Look at the job ads in the service sector , speaking mandarin is often a requirement. Whether intentionally or not the non-chinese are disadvantaged in such situations. We could be pedantic about semantics, but my proposition that “pragmatism isn’t tied to outcomes per se” was in response to your proposal that “everyone should learn English and Mandarin regardless of their ‘mother tongue'” (apostrophes for ‘mother tongue’, mine), since – in your opinion – that gives the most “returns”. I disagreed, because while Mandarin is more common it doesn’t take away the value of Malay and Tamil for instance. That would be a false dichotomy. That the Chinese and the Mandarin-speaking enjoy privileges in Singapore, I agree. Perhaps the alternative to your English-Mandarin proposal would be for students (and their parents) to choose the second language, and to possibly broaden the choices for that second language, beyond antiquated “mother tongues”. I think you’ve pointed out the wrong dichotomy. I did not say the ubiquity of Mandarin takes away the value of learning Malay and Tamil (now that you’ve mentioned it, it does seems to be like that in some ways, but i’m not gonna argue it here.). I merely implied learning mandarin has the best returns/value. There is still value in learning Malay and Tamil or in fact any other languages, but having value doesnt mean its pragmatic. The pragmatic decision should be based on the one with the best returns/value right? so its either the best or its not, because if its not the best it is not pragmatic enough. on the other hand, how you determine which language has the best returns/value on the other hand is less of a dichotomy, which, imo, one a crude way is to look at how widely is spoken as i have mentioned previously. Let’s assume that learning Mandarin has the best returns/value (which is not necessarily the case, but we’ll leave that aside too). For A and B learning mandarin is therefore the most pragmatic. But that conclusion disregards their different learning environments. This is of course a generalisation, though it’ll be reasonable to posit that growing up in a Malay-speaking household A would master Malay more proficiently. So in terms of “outcomes”, it is pragmatic because A could use Malay in a professional setting vis-a-vis a not-as-proficient usage of Mandarin. Of course we’ll end up nowhere, unless there’s a way to quantify: i. the value of a language (regression? with factors like number of speakers, economies of countries) and ii. the levels of proficiency. its probably even more complicated because ‘value of language’ and ‘proficiency’ may not be independent of each other, i.e. its easier to learn/be proficient at something which you find value in.